Construction Applications for the AquaDam - AquaDam Inc. Placing new boat ramps, or repairing old boat ramps, can be tricky. By definition, your job site will be in deep water, and the presence of rip-rap obstructions is almost guaranteed. 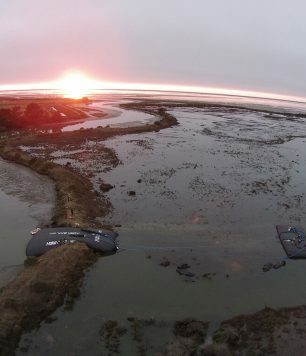 Isolating a boat ramp with an AquaDam is very possible. However, care must be taken to design the path of the AquaDam to avoid any obstructions, as well as not being an obstruction to the work itself. The placement of rip-rap along the sides/end of the boat ramp usually requires excavation to “key in” the rip-rap. The AquaDam must be placed far enough away from the work area that the excavation work does not affect the soil beneath the AquaDam. 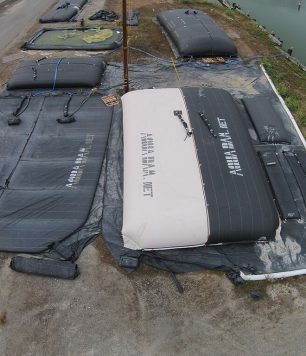 AquaDams are often used to isolate a boat ramp for dewatering. The most important thing to consider on a boat ramp job is keeping the dam away from the rip rap rocks that often lines the three edges of the rectangular boat ramp. These rocks are placed for erosion control, but if the AquaDam is installed on top of them, the spaces between the rocks will still allow significant seepage to flow into the work area during dewatering, reducing or eliminating the effectiveness of the dewatering and seepage control pumps. Don’t install the dam on the concrete pad between the slanting wing-walls of the concrete culvert structure! The AquaDam needs to abut into each bank or wall at a 90° angle. Usually, it is better to put the AquaDam further up- and down-stream from the work area, where there are natural banks and a natural bottom. This will result in a better overall cofferdam. There are (4) methods of water flow diversion that are used in conjunction with in-stream AquaDam installations: In-Channel, Bypass Ditch, Pump Around, or Diversion Pipe. The first three require that the flow of the stream is captured upstream of the work area, diverted alongside the work area, and then discharged back into the main channel, downstream of the work area. 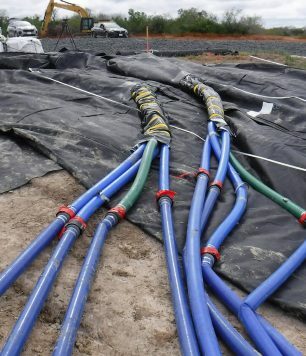 The last option, Diversion pipes, can be placed beneath an AquaDam during installation, in order to pass water flow through the work area, contained within these pipes. The AquaDam on top of the pipe makes a pretty good seal to the top of the pipe, and with the deployment of an “under-dam” beneath the pipe, resulting seepage rates are in line with a typical installation. An AquaDam can conform to Diversion or Bypass pipes that pass beneath it. In this situation, a second, smaller dam is installed beneath the pipe, and filled last, in order to improve the seal around the pipe. 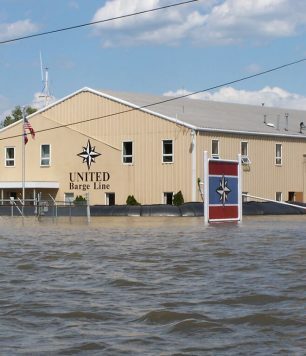 Was your work area supposed to be above “high water mark”, but now water is encroaching? Is there a hazardous spill that needs isolation? Do you want to divert run-off water away from piles of excavated contaminated sediment? The AquaDam is capable of achieving this, and more. Whenever the unexpected need for water control arises, the AquaDam allows you to quickly establish and maintain control. 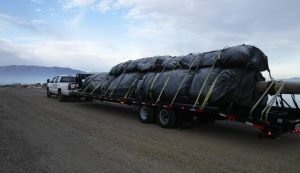 There are significant stockpiles of AquaDams in warehouses across the continental United States, ready to be loaded and shipped within hours of getting “the phone call”. The demand for quick and effective temporary water control does not end at the US border. The world is a lot smaller than it used to be, and the word is getting out about the AquaDam. AquaDams have been successfully installed on job sites in Uruguay, Australia, Dubai, Romania, and all over Europe. Oil and gas pipelines often cross the paths of rivers and streams. If a new pipeline is to be installed below the riverbed, or an existing pipe has to be inspected or repaired, the work area along the alignment of the pipe must be isolated, to support dewatering efforts. 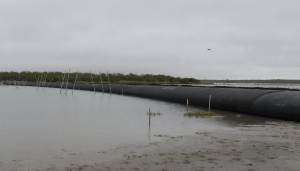 Depending on the scope of work, a “U-shaped” AquaDam cofferdam may be used to isolate a work area along one bank, or a pair of AquaDams, extending from bank to bank, up- and down-stream of the work area. Adequate Flow Diversion and Bypass capacity are extremely important; this usually takes the form of pumps, pipes, or temporary ditches dug around the work area. While directional drilling has made open-cut trenches less common, pipe inspection and repair still requires open-cut excavation. The AquaDam is an effective barrier when used to isolate the intended work area. AquaDams should be placed away from the excavation. Artificial Ponds are often lined with a clay or poly liner. This liner may be damaged due to tree roots, machinery, accidents, or improper installation, resulting in infiltration of the ponds contents into the ground around and beneath the pond. A cofferdam is needed, to isolate a work area around the damaged liner. The cofferdam must not result in a lot of dirt left in the pond at the end of the project, which excludes earth fill cofferdams. The cofferdam must not damage the pond liner further, which excludes sheet piling or other rigid alternatives. 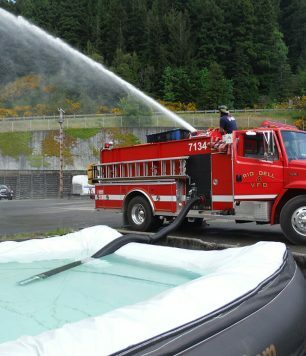 In most conditions, the installation of an AquaDam over a pond liner will result in minimal impact to the pond liner. The existing clay or poly pond liner surface, plus the possible presence of a semi-solid sediment top-cover, means that the coefficient of friction offered to the AquaDam is reduced. This means that when considering what size AquaDam to choose for a pond job, you should seriously consider choosing the next size up than what the chart indicates. Installation of a support AquaDam behind the primary AquaDam is also strongly recommended in these circumstances. Canals are often isolated using AquaDams, because it removes the hassle of soil intrusion into the canal channel. If the walls of the canal are close together, the AquaDam may form a “V” down the center. Support dams are recommended, especially in narrow, steep-walled channels. Diverting a stream or river is no small task, but it becomes a realistic possibility when applying the AquaDam to the problem. Before a stream or river can be diverted, the question of “Where will the water be diverted TO?” must be answered. Diversions normally take (4) forms: pump-around, bypass pipes, bypass canal, or leaving part of the original stream/river channel open to pass the flow. The AquaDam must be controlled during unrolling/filling, in order to keep it taller than the surrounding river depth. The upstream depth may increase as the AquaDam restricts the available flow channel. The AquaDam must be properly sized for the maximum mud/water depth over the lifetime of the project.